France won this weekend’s friendly test match against Italy in Biella. The Azzurri, who in the 65th minute led the match on 21-20, suffered in the final 15 minutes when France took control to win 41-21. 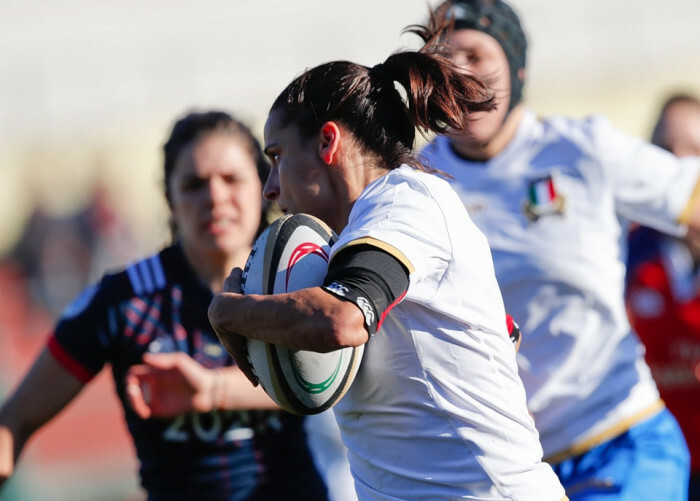 The Italian’s aggression caused serious problems for France, who now took the lead with a great individual try from Manuela Furlan. Nonetheless, France battled back with a penalty from Boudon and a try from Banet giving them a narrow 15-14 lead at halftime. The start of the second half saw Italy back on the attack, with a prolonged period on the French line eventually leading to a third Italian try from Beatrice Rigoni. With Bonaldo on target again Italy lead 21-15. France closed the gap by exploiting the physicality of Safi N'Diaye, but with Bourdon's missing for the first time Italy still lead with just 19 minutes to go. The difference between the sides in the end seemed to come from the benches. Camille Boudaud in particular now came on for France, scoring two tries to put the visitors 34-21 ahead into the last 10 minutes. France kept control and with three minutes to go second row Emeline Gros came on, and immediately scored to end the game with a 41-21 win for France. "We are pleased with the performance of the girls," said Andrea Di Giandomenico, coach of the Italian team. “We immediately found our system in both attack and defence. Until the 65th minute we were in the lead and only in the final stages did France come back. We are also very happy with the new players: to be catapulted at the national debut against a team that has come third in the world... it's not easy. Yes, there are aspects that need to be improved and to put right some mistakes. This is a starting point, though it did not go out way, we are focusing on the continued growth of these players and this team. Italy: Furlan; Muzzo (75 'Cavina), Stefan, Rigoni, Bonaldo (57' Guerreschi); Busato (75 'Gizzi), Barattin (cap. ); Giordano (75 'S.Gai), Locatelli (41' Pillotti), Veronese; Fedrighi, Ruzza (48 'Tounesi); L. Gai, Bettoni (64 'Turani), Giacomoli (17' Ricci). France: Pignot (53 'Coudert); Bannet, Vernier, Filopon (58 'Boudaud), Murie (77' Jason); Bourdon, Torrex Duxans; Menager, Cazorla (48 'Forlani), Hermet (cap. ); N'Diaye, Ferer (77 'Gros); Duval, Sochat (77 'Soloch), Arricastre (77' Jouyeux).